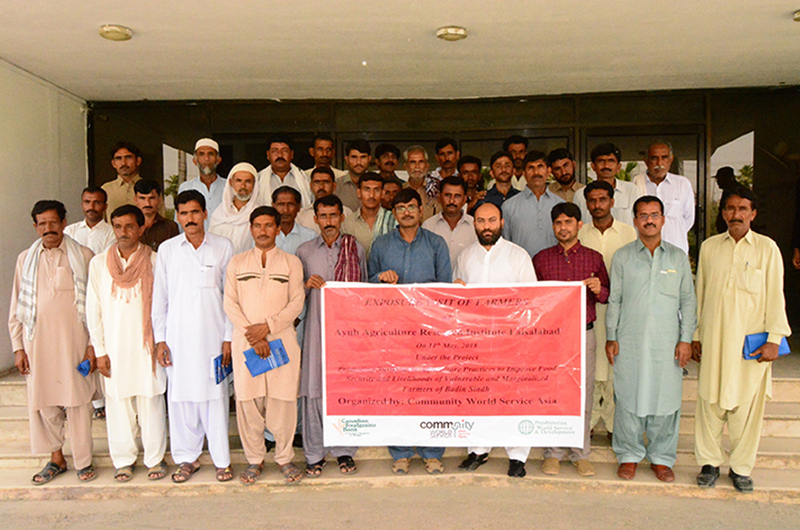 Farmers' group photo with Agriculture Research Officer, Ubaid, at Ayub Agriculture Research Institute Faisalabad. The participants were briefed about the good production of Maize using compost which is made by poultry litter, dead poultry bird press mud and fertilizer. 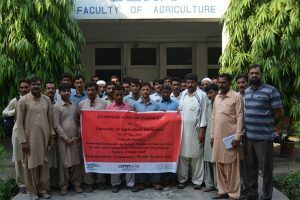 Group photo of Community World Service Asia team and farmers at the University of Agriculture, Faisalabad. Abid Mehmood, Director General AARI, introducing all departments, centers and institutes of AARI, main stations & substations. 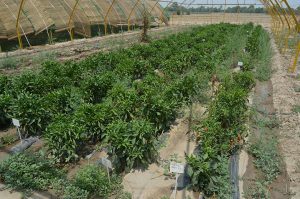 Chilies crop at Vegetable Agricultural Research Institute, Faisalabad. M. Rafique Dogar explains how to develop hybrid varieties of Maize to the visiting farmers’ group. 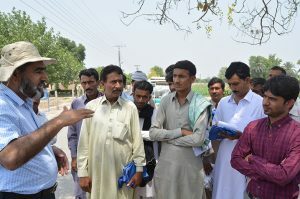 An exposure visit to Faisalabad of twenty-seven farmers and seven project staff from Badin, Sindh was conducted from the 10th to 12th of May this year. The group visited the University of Agriculture and the Ayub Agriculture Research Institute in Faisalabad. A field excursion to the Gatwala Forest Park in the city was also completed. 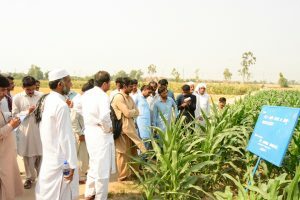 This exposure visit provided the farmers of Badin an opportunity to observe, understand and learn the various and advanced activities carried out in these state of the art agricultural institutions. Most importantly this visit aimed at bridging the linkages between on-ground farmers and leading agriculture research institutes. 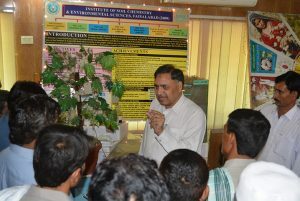 Dr. Abdul Wakeel, Assistant Professor at the University of Agriculture in Faisalabad, welcomed the participants on the 10th of May and gave a brief introduction of the institute and its work to them. Farmers were taken to the university’s nurseries where they observed a variety of plantations and different experiments aimed at enhancing the productivity and yield of crops in process. Dr. Asif Tanveer delivered a comprehensive and informative session on sustainable agriculture practices at the Agronomy Library at the institute which was followed by a questions and answers session with the farmers from Sindh. Many queries of the farmers were addressed and they were encouraged to implement the learnings to expect better outputs in their fields back home. Similarly, the next day, Dr. Abid Mahmood, Director General Research at the Ayub Agriculture Research Institute (AARI) in Faisalabad oriented and briefed the farmers group on the on-going researches and latest breakthroughs the AARI and its sister institute and substations have achieved. The Agriculture Research Officer and member of monitoring and evaluation and Quarantine committee at AARI, gave a thorough explanation of the sister institutes and substation of AARI. The farmers were made aware of the many services they could avail from the AARI institutes; such as acquiring seeds of new varieties and plant saplings, seeking recommendations for better productivity and being provided with copies of relevant IEC material. Dr. Dilber and Dr. Khalid, Scientific Officers at AARI, informed the participants about rearing of beneficial insects, including Tricograma and Phenacoccus aceris, which play a key role in pest management during their visit of the Integrated Pest Management Laboratory. They were also made aware of the advance production technology available for different vegetables at the field site where a variety of crops were produced. At the field area where cereal crop is produced, the farmers were updated on the development of Hybrid seeds, advanced production technology of a range of cereal crops and the availability of newly developed seed varieties at economical prices. After the AARI and on their last day in Faisalabad, the team from Sindh visited the Gatwala forest nursery and park where they explored different species of fruit, forest and ornamental plants. The exposure visit enabled farmers from different communities to interact with and learn from each other, allowing them to view practical examples of successful integration of sustainable practices in farming communities like their own. This platform provided progressive farmers to expand their knowledge and skill by visiting agricultural sites where new technologies and techniques are adopted. The farmers learnt and understood a variety of different available methods utilized to increase and sustain their income. I have learnt about farming of spreading tomato varieties in tunnel. I will practice this farming technique at my own field by making tunnels with available wooden logs to generate maximum revenue in scarce water conditions. I appreciate the efforts of Community World Service Asia for providing this learning opportunity to explore innovative crop production technologies. I was excited to see the different high yielding varieties of vegetables and more contented to learn that we can get quality seeds of these vegetable at our door step at very reasonable prices.I am thankful to the livelihoods team for linking us to these national level institutes. We can learn much more in future for better and updated agricultural practices for productive outcomes.